This amazingly simple hair extension can be easily attached to your head with a single piece flexible translucent wire (more like a fishing line). The wire is customized as per your head size and takes under a minute to fit in. Despite being one of the most easy to install these types of hair extensions, it is not well known among the hair extension users. +They is virtually no chance of Halo hair extension slipping from your head. The holding wire (coupled with your natural hair) holds tight. +You don't like to spend hours getting ready and want quick, easy added length and volume. All hair extensions have a tendency to tangle when you sleep on them. If you want to avoid a messy brush job in the morning, avoid sleep with your halo hair extensions on. 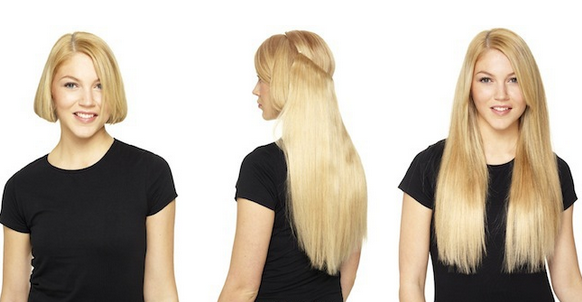 Always comb your halo hair extensions with a loop brush or tooth comb. These extensions tend to get dry over time, so it is advisable to shampoo them only after 4-5 uses or upon appearance of dullness. Always opt for a shampoo meant for dry hair and don’t forget to apply conditioner after a shampoo treatment. However, beware that excessive shampooing can reduce their life span owing to resultant dryness. Always take the extension off before washing them!